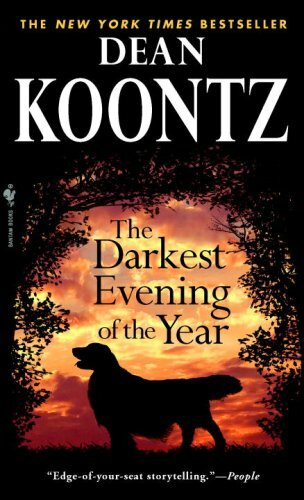 The Darkest Evening of the Year was recommended to me from the All Things Dog Blog. This book is a suspense thriller/mystery novel by Dean Koontz. The story centers around a Golden Retriever with an angelic spiritual presence. This Golden Retriever, Nickie, is rescued from a dangerous situation by Amy, who is a lover of Golden Retrievers and part of a Golden Retriever rescue group. We say that Amy saves Nickie, but in truth, it is Nickie who ends up saving Amy, her boyfriend Brian, and an abused little girl named hope. From the moment that Amy rescued this dog, Nickie, she realized that there was something extraordinary about her – something almost divine. Nickie seems to have an understanding beyond any ordinary dog. She does things which are dog-like but it triggers memories from Amy’s mysterious past – memories which Amy has been trying to forget. Brian also recognizes there is something special about Nickie, but he isn’t quite sure what it is. He sees it in her eyes and tries to capture it on paper. He is an architect, not a pencil artist, but he is compelled to draw her eyes over and over again. As he draws deeper into her eyes, he experiences something beyond this world. But he doesn’t quite reach it. How can a mere pencil capture something so divine, after all? But his pencil drawings still have a magical affect. They are confiscated by one of the antagonists of the story. The antagonist is highly distracted by the drawings and wonders if perhaps his evil life isn’t as full as it could have been. But there is no redemption from one so evil. Other antagonists of the story are far more evil. They lead Amy and Brian with Nickie through a series of mysteries and adventures which ultimately leads to a culminating conclusion. All the questions raised at the beginning of the book are answered, except perhaps of the mysteriousness of Nickie. While this question is not answered, it is obvious that she was something divine. The Darkest Evening of the Year is a page turner. Almost every chapter kept me hanging. Like Brian and his drawings, I was compelled to keep reading until well passed bed time. When I put the book down, I couldn’t help but to keep thinking about it. And when I finally reached the ending, I was satisfied. The characters are captivating, the story is riveting, and the conclusion is fulfilling. How much would you spend on a dog bed for your large dogs? It depends on both price and quality, right? In my quest to find the biggest dog bed for the best value, I came across the Caddis Corner Dog Bed. It is a little more than I wanted to spend, but it seemed to be the least expensive as compared to its size. So I bought it. I expected some flimsy thing which I probably could have made myself if I had the time. But when I got it, I was pleasantly surprised with the quality. The Caddis Corner Dog Bed for big dogs has Hypro-Loft fiber as its filling. I really like this stuff. I would curl up on this dog bed for a rest if it didn’t smell so much like my dog Maya. According to Caddis, this fiber isn’t going to clump together no matter how much your dog uses it or how much you wash it. Only time will tell if this is true for my dogs. I can’t tell you how many times I have gotten a dog bed and had to throw it away after a year or two because the washing made it all lumpy. Has that ever happened to you? The Caddis Corner Dog Bed also has a nice comfortable cover which can be easily unzipped and removed. This way, you can wash the cover as often as you want, and perhaps limit the washing of the filling – making the bed last even longer. I also like the bolstered corners of this dog bed for large dogs. Maya can rest her head on the bolster and stretch out her long legs. I also considered getting an orthopedic dog bed for Sephi. She is almost 10 years old now and will soon start to exhibit old dog health issues like arthritis. An orthopedic dog bed is made from memory mix foam which is very resilient and supportive for an older dog. This will be good for Sephi when her joints start to give her trouble. I will post a review on an orthopedic dog bed when I get one for her. Dogs love to jump when they greet or play. This may have been cute when your dog was a puppy, but now that he is all grown up it is not so cute anymore. It is probably annoying and sometimes even embarrassing when you have guests over. So what can you do about it? You may be tempted to physically restrain your dog, yell at him, or possibly even use physical punishment. But these negative reinforcement methods are not the easiest – or the best methods to teach your dog not to jump. Negative reinforcement methods include leash corrections, the knee-in-chest method, yelling, and/or physical punishment. While these methods have been proven to work, they do not work with all dogs. Some dogs may even resent such harsh training methods and such resentment may lead to other behavior issues such as overly submissive behavior or aggression. Not to mention that you may lose the joy of your dog wanting to greet you at the door when you come home. Better training methods use negative punishment and positive reinforcement. But before we explain these methods, let’s talk about prevention. Training may take some time so prevention is something you can use to teach your dog not to jump in the meantime. The best prevention method is the no jump dog harness. Personally, I have found the no jump dog harness complicated to put on, but it worked great on my dog Maya while I was working with her. 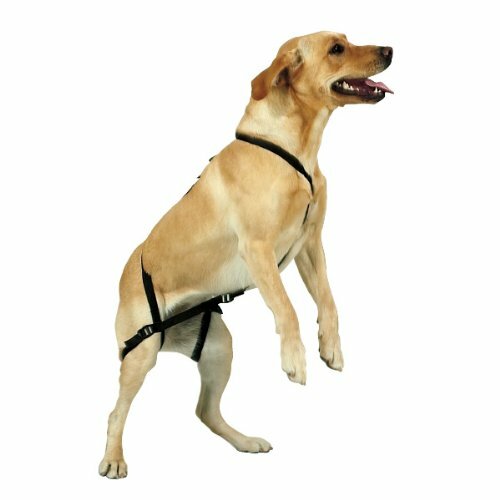 Put the no jump dog harness on when you are able to keep an eye on your dog and in situations where your dog is inclined to jump. You may not want to leave the no jump dog harness on when you are not home or not able to watch your dog as your dog may try to chew it off. Praise your dog and play with your dog while they are wearing the no jump dog harness so that they learn to associate the harness with good things. Negative punishment sounds like a bad term. But actually, it involves no physical force what-so-ever. Negative punishment simply means that you are taking away something the dog enjoys. How does that fit in with how you teach your dog not to jump? Well, think about the reason why your dog wants to jump. He wants your attention, right? So if he jumps on you, take away your attention. Give him a sharp “no” or “eh-eh”, then turn around and ignore him. If he tries to come back around to face you, turn away. Keep doing this until he stops trying to jump. Use the negative punishment method of taking away your attention in combination with the positive reinforcement method when you teach your dog not to jump. Positive reinforcement is rewarding your dog when he does well. So when he is calm, give him the attention he wants and praise him lavishly. This method may take some time but it is the most effective and does not lead to further behavior problems. Teach other members of your family to do the same. And if your dog tries to jump on a friend or stranger who says, “That’s okay, I don’t mind,” tell them the method and help them understand that you are trying to teach your dog good manners. To teach your dog not to jump may be a long process, especially for a young and exuberant dog, but it is very rewarding. No more wet or muddy paw prints on your clothes, no nearly getting knocked over, and no embarrassing moments with your dog jumping on other people. 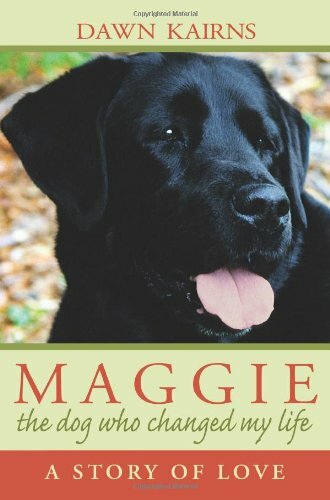 “Maggie: The Dog Who Changed My Life” by Dawn Kairns is a true story about a very special dog. Dawn talks about her relationship with Maggie as being very close, even spiritual. Have you ever had a dog which seemed to really understand you? Not just your words, but your emotions too? Was there one special dog which stood out amongst all the pets in your life, a dog who was your one and only true soul mate? That is what Maggie was to this author. Her relationship with Maggie reminds me of my relationship with my childhood pet, Cassie. I have owned many dogs in my life, but Cassie was so much more. As I read about Maggie, I understand the depths of the author’s relationship with her and cherish the book all the more. Chapter one of “Maggie: The Dog Who Changed My Life” begins with the author telling us who she is, her family situation, and why she got a dog. Chapter two goes into Maggie’s beginnings. 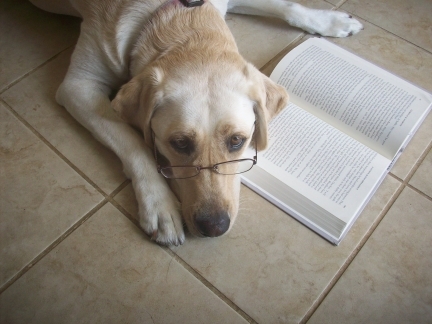 The author says she made some training and other mistakes with Maggie out of ignorance, but dogs are smarter that what we give them credit for. Despite those mistakes, Maggie seemed to really understand her and grew to be very good dog. Further chapters of “Maggie: The Dog Who Changed My Life” go into the author’s spiritual perspective of her relationship with Maggie. It was like Maggie somehow knew what was needed of her without ever being trained. The author also described Maggie’s spiritual energy and zest for life which was attractive to many people. Maggie had a way of bringing a smile to everyone’s face. Maggie had some major health issues. The author talks about finding the right vet for Maggie. She talks about one vet in particular which she felt in her gut was probably not right, but went with her head instead. She says that this was a mistake and learns the hard way to listen to your vet, but don’t be afraid to get a second opinion and ultimately go with what you feel is right. Take how your dog feels about their vet into serious consideration as well. The author also discusses dream interpretation. She feels that some of her dreams about Maggie may have been premonitions and that Maggie may have in some way influenced those dreams. And she believes that some of her dreams were ways in which her subconscious was trying to tell her that something, such as a certain vet, wasn’t right. While the concept of dream interpretation is beyond me, some of what the author discusses makes sense. Other issues which the author talks about is holistic veterinary care such as acupuncture, consumer dog food versus homemade dog food, dealing with the loss of a dog, and the possibility of some dogs having a sixth sense. There is no doubt that some dogs, like dogs who can sense when an epileptic is about to have a seizure, have a sixth sense. But does it go beyond just sensing health issues? Can some dogs sense our emotions and intents without us doing anything to outwardly show them? Our relationship with dogs is a unique and special relationship. There is no other relationship like it. The bonds, health benefits, and service which dogs provide is truly miraculous. “Maggie: The Dog Who Changed My Life” is a really great read. Even if you don’t agree with some of the author’s beliefs, there is no denying how special Maggie was. If you have had a similar relationship, then you will cherish this book as much as I have. You can find this book at our Amazon.com a-store called the Dog Lover’s Book Store. Check it out and tell us what you think. Expand your knowledge about the dog breeds of the American Kennel Club (AKC) to dogs of the world. Dogs have been helping people for thousands of years with a myriad of tasks. Dogs have been bred for hunting, herding, farming, cart pulling, guarding, and more. Today, they also police, search and rescue, and provide guidance for the blind. One particular type of dog breed falls under the definition of a spitz-type dog. Spitz-type dogs are generally thick coated as they originated in the harsh northern regions of Europe, Asia, and North America. They were bred primarily for hunting, herding, and for pulling sleds. Modern-day spitz breeds include dogs of all sizes. Some smaller spitz-type toy dog breeds have been developed including the Pomeranian dog breed and the Papillon. Larger spitz-type dog breeds include the Alaskan Malamute, Eskimo Dog, Samoyed, and more. A common spitz-type dog of Russia is the Laika dog breeds. There are a few different Laika breeds – Laika being the Russian name for all spitz-type dogs. 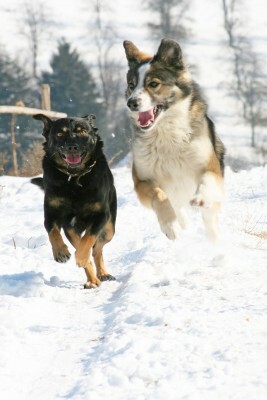 Laika dog breeds in Russia were used to hunt big game such as elk or bear, and to hunt dangerous game such as wolves. Laika dog breeds were also used to hunt smaller game – more specifically, the East Siberian Laika made a good gun dog. The West Siberian Laika is the most popular of the Russian Laika dog breeds. He was used to hunt large game as well as to pull a sled. He is also good with hunting small game. The West Siberian Laika can have very similar coloring to a wolf. But they can also be much lighter, black and white, or solid black. Another very distinctive trait of the West Siberian Laika is his curled tail. This curled tail is prominent in most spitz-type dogs. Consider the tail of a Chow Chow, Malamute, or Samoyed. If you ever visit Russia and see a wolf-like dog with a curly tail, it is probably a West Siberian Laika. 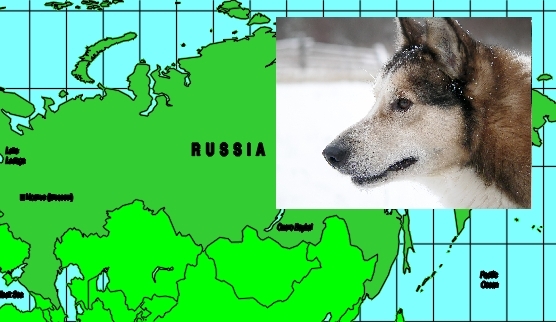 It could also be an East Siberian Laika. 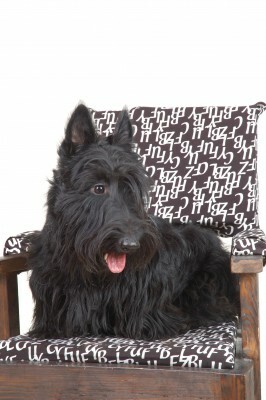 Another Laika dog breed is the Russo-European Laika which is generally black and white in color. Now you know a little about the Laika dog breeds of Russia. Share this information with your friends and visit us again for more information on dogs of the world. Despite his smallness, the Lhasa Apso dog breed is not in the toy dog breed group of the American Kennel Club (AKC). Although he was once in the terrier dog breed group, he does not have the characteristics of a terrier and so he now falls under the non-sporting dog breed group. The Lhasa Apso dog breed has origins in the monasteries of Tibet. His original purpose was as both a watchdog and companion. In fact, his other name Abso Seng Kye means Bark Lion Sentinel Dog. The Lhasa Apso dog breed has a lot of similarities with the Tibetan Terrier and Shih Tzu dog breeds and are often confused. In early AKC registries, they were all considered one in the same breed. Although the Lhasa Apso dog breed is a small dog (10-11 inches tall and 13-15 pounds), he makes a good watchdog because he will bark at intruders. He is wary of strangers but has a happy disposition with his family. He also generally gets along well with other pets. The smallness and temperament of the Lhasa Apso dog breed makes him a good family companion. He requires only a short walk or a little play time per day. He can be both playful and affectionate. The Lhasa Apso dog breed, however, can be a bit independent and stubborn. Positive reinforcement is the best way to train this dog breed. Negative reinforcement is no fun for him and he will be inclined to react negatively in return. While the exercise of the Lhasa Apso dog breed are minimal, his grooming requirements are a bit more involved. He needs a good brushing or combing daily and a regular shave to keep his hair from getting matted. The hair of the Lhasa Apso dog breed is straight, long, and dense. He has a feather tail, feathered feet, feathered ears, and long hair on his face. The Lhasa Apso dog breed has a tail which should be shorter than the length of his body. The tail is carried upwards and over the back. He has a narrow skull, a prominent black nose, and an even or slight undershot bite. The Lhasa Apso dog breed is an adorable dog breed. But like most purebred dogs, he can acquire a number of genetic health issues. The most common are patellar luxation, various eyelid problems, progressive retinal atrophy, and renal cortical hypoplasia. Patellar luxation is a skeletal issue with the knee cap. It can be very painful and lead to lameness. Progressive retinal atrophy is where the retina of the eye deteriorates, possibly to the point of blindness. And renal cortical hypoplasia is failure of the kidneys which can be deadly. If you are considering purchasing a Lhasa Apso dog breed, be sure to research the breeder thoroughly. Ask if they are a member of any other breed clubs other than the AKC. And ask if they have done any testing to confirm if the dog is not prone to any hereditary diseases. A good and responsible breeder will probably also be a member of the American Lhasa Apso Club, Inc. and they would have done some testing on the breed to verify his quality. A good purebred Lhasa Apso can also be found at Lhasa Apso breed rescue groups and possibly even at the local animal shelter. Remember the post where I said I was going to teach Maya some dog tricks from the book, “101 Dog Tricks”? I was finally able to set aside some time and teach Maya how to shake hands with either her left or right paw. I also taught her to spin circles. These tricks were super simple to teach her and took almost no time. Maya already knew how to shake paws, but she didn’t know the difference between left and right. The book actually has you use one hand signal and two commands. The two commands are “shake” for left paw and “paw” for right paw. Despite the different commands, I think Maya figured it out by whichever hand I put out. If I put out my right hand, she gives her left paw, and vise versa. Spin circles was a little more difficult, but not by much. The book actually teaches to spin either clockwise or counter-clockwise. I have only taught Maya clockwise. The command for clockwise is “around” but I say “turn around” instead. Maya actually learned it so well that I don’t have to say anything. I can actually just turn my hand in a circle and she does it. How much time did I spend? Less than 5 minutes a day for about 15 days. I know my recent post about procrastinating was less than 15 days ago, but I have actually been working on these tricks for some time – just not every day in a row. The “shake” for example, was started when I first bought the book and did a review. However, I procrastinated and worked with Maya maybe once or twice a week – less often during the holidays. But after the holidays and after my procrastination post, I worked with her every day until she completely understood. These tricks aren’t very useful in the everyday scheme of things, but they sure are cute. And just look at how much she enjoys it. Remember that teaching your dog tricks is a good way to help your dog learn that training can be fun. Teaching your dog tricks is also a good way to bond and establish a good relationship with your dog which will eventually lead to an all-around well-behaved dog. Every year stories abound of dogs falling through ice and both dog and owner dying because the owner tried to save him. Every year, the veterinary hospitals receive an increased number of animals injured with frostbite, hypothermia, or other cold-related ailments. And every year, animal cruelty officers are sent to investigate owners who don’t take care of their dogs properly during the winter months. No matter whether your dog is better suited for the indoors or outdoors, special care is always needed for every dog during the cold weather months. Check out the simple but extensive checklist below. *Give outdoor dogs shelter with straw (not hay) or a dog bed. Do not use heaters unless they are approved for animals. Consider a heated mat for animals which can be placed under a blanket or dog bed. 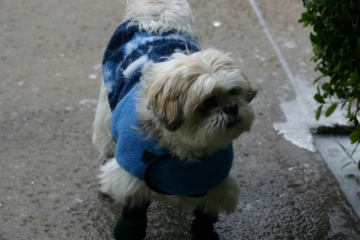 *Consider a dog sweater and booties for small dogs or dogs which are sensitive to the cold. *Outside dogs need more food because they burn more calories in order to keep warm. Indoor dogs who get less activity in winter months may need less food in winter. *Always bring your dog indoors for extreme weather. Even a hearty winter dog breed like the Husky may not be able to handle an extreme ice storm or blizzard. *Keep puppies and older dogs indoors. *Make sure dogs always have fresh water with no ice. Get a special heating dish or give fresh water frequently. *Check your dog’s ears, tail, and feet for frostbite. *Check your dog’s feet for ice. Ice balls can form, especially if your dog has long hair around their feet. Trimming the long hair may help. Remove ice with a warm washcloth. Also check their feet for cuts. *Walking dogs on sidewalks melted with salt is okay but make sure you rinse their feet off with warm water when you get home. *When going for walks, keep your dog on a leash at all times. Dogs can get lost in the snow because all the scent markers have been covered. Keeping them on a leash will also keep them from running over ice and falling through into a body of water. *Be careful of ponds and other bodies of water. If your dog falls in the water, call for help. Do not go after him yourself. *Make sure your dog is completely dry after grooming before putting them outside. *Beware of antifreeze from cars. Antifreeze is tasty to dogs but deadly. *If you travel with your dog, don’t leave him alone in the car. In summer months where your car becomes an oven, the opposite occurs in winter where your car becomes a refrigerator. As a dog trainer, I think the clicker is an awesome training tool. Even though clicking to train sounds very simple, it has to be used appropriately or it may not work effectively. You have to click the moment the dog does good. And you have to use it EVERY time. As a dog trainer, I don’t use the clicker. Why isn’t it for me? Because I prefer to give verbal praise. I just can’t help myself. Trying to get in the habit of clicking is really difficult for me since I have trained using verbal praise my entire life. And I started dog training early (I started at age 10 with my beloved Sheltie and childhood friend, Cassie). *Positive reinforcement – Clicker training followed by a treat is a clear signal to your dog that they did well. When they don’t do well, they don’t get a click and don’t get a treat. No negative reinforcement applies with clicker training. *No force – There is no need to force your dog with a leash or collar jerk with clicker training. Reward your dog when he does what you want and do nothing when they don’t. *Easy to use – It is a simple click and a treat. *Easy for the dog to understand – Your voice can vary in tone and you may inadvertently convey frustration or impatience. The click is a clear and concise sound. 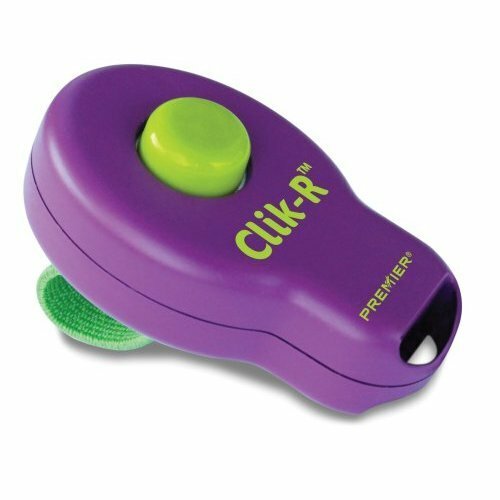 If the clicker is used consistently and right when your dog does well, they quickly come to understand the sound of the click as a job well-done. *Builds confidence in the dog – Rewarding your dog when they do well with a click and avoiding any negative reinforcement helps your dog learn what to do instead of what not to do. *Great training tool for dogs who are usually shy or stubborn during training – Both shy dogs or stubborn dogs can give up during training if they are having trouble understanding what you are trying to teach. Clicking gives a clear signal of when they have done well. *Can I remember to use the clicker during training every time my dog does well? *Can I consistently click right at the moment that my dog does well? For a basic beginning in clicker training and tools, visit our Amazon.com a-Store – Dog Training Supplies.